The chart below shows the fund manager survey which asks what the most crowded trade was in April. As you can see, long FAANG and BAT was said to be the most crowded although it lost ground, falling to 33%. With NFLX’s rally on Tuesday after its subscriber beat, it’s clear that stock is crowded. However, some of the tech stocks have had significant corrections in the past two months. Short term action is all about sentiment, but earnings will be providing the direction for these firms in the next couple weeks. Even if the group is overbought, they will rally with strong results. AAPL reports May 1st; AMZN reports April 26th; Alphabet reports April 23rd; and Facebook reports April 25th. TSLA surprisingly hasn’t announced its earnings date. That’s disconcerting because it’s expected to be in 2 weeks. I think the FAANG being selected as the most overcrowded trade occurred because there wasn’t anything else to pick rather than it being extremely overbought. As I mentioned previously, the cash position had a high z score. 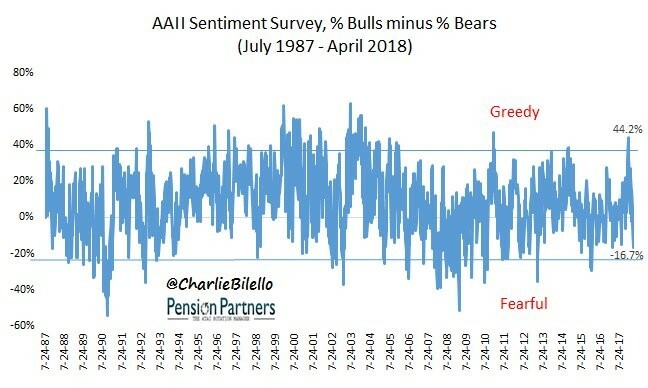 As you can see from the chart below, the AAII sentiment survey went from extreme greed to near fearful. The CNN Fear and Greed index had gone into the single digits. The latest update in that indicator is 32 out of 100 signaling fear as the market has done well this week. Part of the reason stocks didn’t rally as quickly as after a normal correction is because the extreme optimism needed to be removed. I’m not sure completely sure of what the changes in central banks’ balance sheets will do to equities. January was a big month for the slowing of the ECB’s purchases, so some investors were fearful it would cause volatility. This ended up occurring late in the month, but I think that had more to do with the slowing growth, fears of inflation, and the unwind of the short VIX trade. If stocks rally at any point this year, the narrative that central banks’ asset purchases cause equities to rise will be broken. Clearly, causation doesn’t equal correlation, but the narrative still exists if there are charts with manipulated axes to prove it.